We are back! Ignacio has been so busy as a Senior Architect and Urban Designer with the Regional Transportation District, a Colorado State chartered district currently building 120 miles of rail transit, that we hadn't had the opportunity to update this blog. We wanted to share with you our entry to the Boulder Civic Center Ideas Competition. Our entry was titled "From the Linear Park to the Central Park," making reference to the original design by Frederick Law Olmstead Jr. for Boulder's linear park along the Boulder Creek. The central idea is to "make" a proper central park in downtown Boulder. The entry was listed as a finalist. Please click on the image above to see the full-size drawing. To see the winning entries please visit bouldercolorado.gov. "The BIG IDEA is to expand the Central Park into the linear park as it was conceived by Frederick Law Olmstead Jr. in 1908. 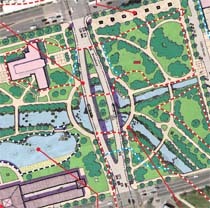 To achieve this task, the Central Park needs to grow from its present western limits at Broadway to 9th Street, and in the process incorporate all remaining and new elements into a new Central Park. An expanded Central Park means an expanded Civic Heart of Boulder too. A major move is the tradeoff of the high-hazard area volume by creating a flood-control pond in lieu of developable land. The pond will increase the riparian biome (lands) by adding 1,500 feet of waterfront and 1.4 acres of surface water and will be used as a recreation amenity with the underlying principle that its practical function is flood management. The band shell will be relocated to the west under a wire dome that increases audibility and prevents noise pollution; seating area will be increased to four times its present capacity to 50,000 square feet. The Yocum Building will be moved next door to the BMoCA to help define the eastern edge of the Central Park. A new sculpture garden will front Canyon Boulevard. The farmers market will be relocated in a new and permanent open-air structure under a 40,000 square-foot roof along Arapahoe Avenue; the design repurpooses the roof of the Atrium building. The Broadway Bridge will be replaced with a signature bridge that will increase head-room below the bridge to create a sense of place at the divergence of the Farmers Ditch. A street car connecting the Hill to the 29th Street Mall will cross the new bridge and will be housed at one of the multi-use buildings at the eastern end of Central Park. Buildings and parking removed from the hazard zone will be replaced by new buildings and structured parking on safer grounds. An increased and widened network of paths will complete and connect Central Park with the linear park and the rest of the City." 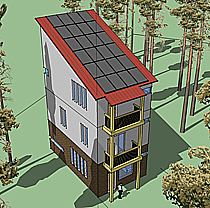 Urban Designer just designed a net zero-energy and photovoltaic spec house in a forested suburb of Northeast Atlanta. The site is two-thirds of an acre in a subdivision that developed in the seventies and eighties; the parcel did not develop at the time so the pine trees are dense, tall and mature. The idea is to develop a 3 Bed/2.5 Bath home with a minimal footprint that can supply most, if not all, of its electric power from the sun. The footprint of the house is 600 square feet, and it towers 40 feet among the pine forest to catch sun light in a perfectly pitched roof facing south. The photovoltaic system is 7.7 kilowatts and the passive solar component comes from the perfect orientation of the house and the strategic location of windows and balconies over windows to maximize heat gain in the winter and cooling in the summer. We have designed a net zero-energy community building for a neighborhood in Kansas. The building is not only solar passive, but its photovoltaic system will generate at least 15,000 kilowatt/hours per year. Because the building is adjacent to a community garden, the rainwater will be captured and directed to the orchards and vegetable beds. The fenestration, or the windows arrangement, in conjunction with canopies and eaves are designed to respond to the sun differently each season of the year, so low winter sun will be allowed inside to heat the spaces whereas high hot summer sun will be blocked by the building’s roof. 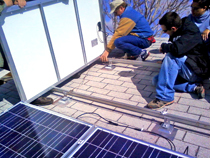 Urban Designer has designed its first residential solar photovoltaic (PV) system. 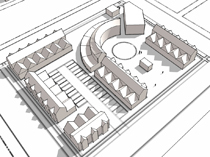 The design is part of a proposal for services we entered in conjunction with Thames Solar Electric. When built, the system will be a 5.5 Kilowatt array able to cover 61 percent of the residence’s use on a yearly average. We propose the use of the newest technology available in crystalline silicon solar cells arranged in a photovoltaic panel. The proposed PV module of 17.5 square feet can generate a maximum power of 230 watts. With 24 panels receiving an average of 5.5 hours of sunlight at 80 percent efficiency and loosing an additional 3 percent (because the roof is not oriented straight to the south) we are able to produce 23.5 kilowatt/hours in a day. 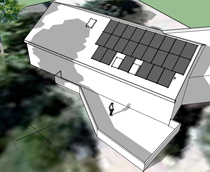 The image above illustrates how we plan to install the solar PV system in order to avoid tree shade and maximize insolation. The Perlman addition is a 200 square-foot painter’s studio in a beautiful 1920s historic home in Denver’s East 7th Avenue Historic District. We are proud to report that the addition was approved by the Denver Landmark Historic Preservation Commission. Following the directives of the Secretary of the Interior’s Guidelines for Historic Preservation, the addition respects the context of its parent structure: the volume follows the same roof slopes but it does it in a way that opens a clerestory to the west to allow for indirect afternoon light (see picture). The east has a large window and is the main source of natural light for the studio. The building materials relate to the parent structure up to the wainscot, which is in a Denver type of coarse brick. From the wainscot up, the materials become modern, corrugated metal siding and standing seam metal roof. We hope to star construction soon and will post pictures once the addition is completed. In our effort to continue serving our clients needs, Urban Designer has completed the required NABCEP training for photovoltaic solar power and we are looking forward to apply for installer certification by NABCEP in the near future. In the mean time, we will be serving our clients with the support of solar power pioneer, master electrician and NABCEP instructor Ken Thames of Thames Solar Electric. Thames Solar Electric, who got its start in the solar business doing Off-Grid systems in 1996 in the Colorado mountains, has provided us with a powerful 40-hour training course that covers in a detailed manner all aspects required for applying for Photovoltaic installer certification; the course included Safety & OSHA, Electrical Basics, Basics of Photovoltaic, Mounting Systems, Advanced Photovoltaic, Design based on the NEC (National Electric Code), Grid-Tied Only Systems and Battery Based Systems. 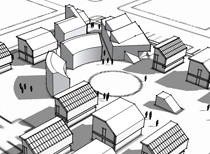 Urban Designer continues to develop a concept for a net zero-energy neighborhood in the rural American Midwest; the work is being done as a collaborative with other architects through the Hyperform Design Co-Op and lead by architect Michael Tavel. Creating a net zero-energy neighborhood requires that all buildings be passive solar and active solar. Passive solar buildings fulfill five requirements: 1. Sunlight enters the building, 2. There’s a surface that absorbs the solar heat, 3. A thermal mass – the material that stores the absorbed heat (concrete, stone, brick; or a water tank), 4. A distribution method to circulate the heat, and 5. A control mechanism to regulate the amount of sunlight entering the aperture (a roof overhang designed to allow more sunlight to enter in the winter, less in the summer). Active solar systems include photovoltaic and solar hot water mechanisms. As Americans slowly inch toward austerity in the use of energy, this concept brings a compromise between the comfort of traditional 20th-century American homes and the reduced total cost of ownership due to improved energy efficiency. This means that building types change into types characterized by compact design and the application of materials not commonly used, such as concrete. Urban Designer continues to explore the capacity of net zero-energy buildings to create distinct urban spaces; given that this building type is characterized by solar orientation and placement, the challenge is to create spaces with buildings that are predominantly mono-directional. Initial concept for a net zero-energy neighborhood. Urban Designer is working on ideas for a net zero-energy neighborhood in a small Midwestern town. Today we can find technology that enables buildings, mostly residential, to have net zero-energy consumption and zero carbon emissions annually. However, these definitions do not include the emissions generated in the construction of the building and the embodied energy of the structure. So much energy is used in the construction of a new building that the operational energy savings over its useful life can be negligible. Urban Designer is bringing to the vanguard that a net zero-energy neighborhood has the potential to be notable for its ability of creating living urban spaces as well. Our approach to reduce costs is to pilot a prefabricated building system that minimizes embodied energy and materials during construction. Over the next week we will be transforming the traditional design that you see above to further develop its suitability to net zero-energy building. We are open for Business, Again! Today we are re-launching our website for our costumers and visitors convenience. We have had a great start: our first project was the Latino Community public participation component of the Aspen Area Community Plan for the City of Aspen which yielded the Community Development Award at the Colorado American Planning Association Conference in the fall of 2009. We also contributed in a similar role to the City of Glenwood Springs update to its Comprehensive Plan. Urban Designer was a design consultant for the City of Kigali responsible for the development of four sector plans in the City. In the spring we accompanied Carl Worthington and Russ Buttler to Minneapolis to receive, on behalf of OZ Architecture, the 2009 Daniel Burnham Award for the City of Kigali Conceptual Master Plan, the American Planning Association’s highest honor for a comprehensive plan. We have been busy on architectural projects as consultants for student housing in Boise and on the remodel of the Perlman residence in Denver. In addition we are representing the art work of Juan R. Correa in the United States. We are also proud to be part of the Hyperform Design Co-Op; Urban Designer is contributing in the Greensburg, Kansas project, the City of Denver Zoning Ordinance Draft revision on behalf of the Platte Park People's Association, and is facilitating the Co-Op's mission statement draft process.